Material Standard: ASME/ANSI : B16.47, B16.48, B16.5, B16.36, B16.9, B16.28, MSS SP 95. Sizes Available: 1/2, 1, 2, 3 inch etc. We are offering GI Cross Forging to our clients. We are offering Equal Cross to our clients. We are one of the prominent names of the field that engage in offering PTFE Lined Equal Cross that can be acquired in multiple nominal bore sizes. 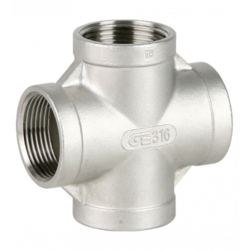 Lined using premium quality PTFE material, these equal cross fittings are extremely popular for their tough construction, ease of installation and high resistance to corrosion. 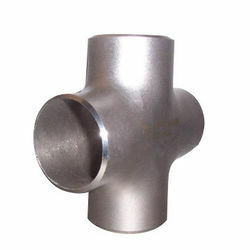 Forge Four Tee Cross Pipe Fittings: Our clients can avail from us Cross Pipe Fittings, which are fabricated using premium grade material and have high degree of tolerances and dimensional accuracy. Further, our cross pipe fittings are used in many applications in oil, gas, petrochemical, automotive, chemical and processing plants. VescoaT supplies and manufacturer of FEP / PFA Lined Equal Cross / Unequal Cross of various size, Non Standard size on Request, We also manufactures in PFA / FEP / HDPE lined Tee as per international standard of ASTM F1545.